You may remember back in the summer when we first rolled the guinea mobile out to pasture. With 20+ guineas onboard it was quite a ruckus. After our "House Guineas" amazed us with their tick destroying abilities we decided to see if a team of "Field Guineas" could do the same for the rest of the property. The guinea mobile would also provide shade and shelter for the goats. In the latter respect it performed admirably. The goats are always dry when it's raining and cool in the shade when it's hot. When it comes to the whole "guinea housing" aspect, however, it's over. It all happened in September/October when the guinea mobile was in a paddock near the house. Since we move the goats on a regular basis and the guinea mobile always goes with the goats it was just a matter of time before the goats and their guinea mobile made their way close to the house. In the back of my mind I worried that the respective guinea clans would hear each other and form a pack. I figured if anything the House Guineas would join the Field Guineas since the Field Guineas had a bigger posse. Then we'd be out of luck for tick control around the house... and that would be a disaster come spring. In reality, it happened the other way around. Last week Lady Guinea and Sassafras were due to hatch their eggs. I wrote about their dueling nests here. And an eventful week it was. I'll start with the good news first. Lady Guinea, out of the 23 eggs in her clutch, hatched 18 rambunctious, baby guinea keets. On Tuesday we knew the baby birds were due, so we checked up on LG and Sassy in the morning. Both were dutifully sitting on their nest, business as usual. LG's nest, however, had some peeping coming out of it. We knew some eggs had hatched. Stealing babies from a guinea is no small feat. Guineas are aggressive around their babies, just ask our mail-lady. Whenever the guineas have babies I have to be very careful where I'm walking in the yard. Just this morning I thought I was fine on the other side of our garden planter. Nope. Within a couple seconds I had Lady Guinea perched on my arm pecking at my face. She's lucky I hadn't had my coffee yet and was barely coherent enough to fling her back on her babies. To extract the little peepers from under her feathered shroud Sweetbreads donned her thickest boots and timidly stuck her toe near LG's nest. Not wanting to leave her eggs, LG pecked and squawked, alerting the male guineas to the infiltration. While the charade took place I came from behind and grabbed LG. Sweetbreads deftly snuck 7 keets into a box, I dropped LG, and off we went. Guinea Cent and his pals, in the meantime, had come to LG's rescue and were on the verge of attacking us. Luckily, we escaped their talons. 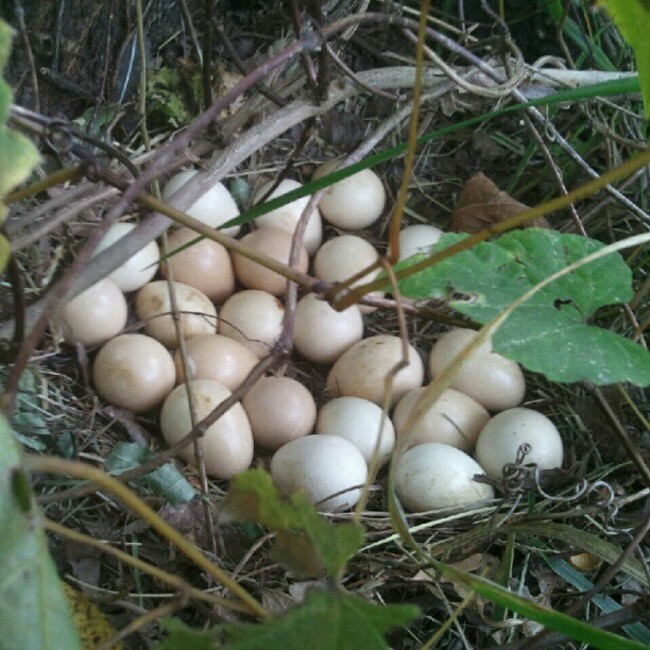 The remaining 16 eggs were still under her. She hatched 11 more by Wednesday. For the past three weeks two of our yard birds have been "gettin' broody". They're both extremely dedicated. The silkie, named Sassafras, or Sassy for short, will go for days without getting off the nest. The guinea, Lady Guinea, gets off everyday to eat and drink. Lady Guinea also stays highly alert and will fly at you if you come near. Sassy enters what I call "monk mode" and does not open her eyes. She just sits there completely still so she can preserve all of her energy. If you try to pick Sassy up she will puff up and make a harmless attempt to peck at you. Lady Guinea, on the other hand, will tear you up. Talons out, flying at your face. Both have lost a lot of weight on their mission to hatch some babies. Each hen has her own little nesting spot. Lady Guinea's previous attempt at getting broody only resulted in three chicks from a nest of 24 eggs. By the end of her 28 day broody period there were only 5 eggs left and she hatched out 3 of them. Her first nest was raided. She now has a different spot. It's on the opposite end of the yard, below a big oak tree. 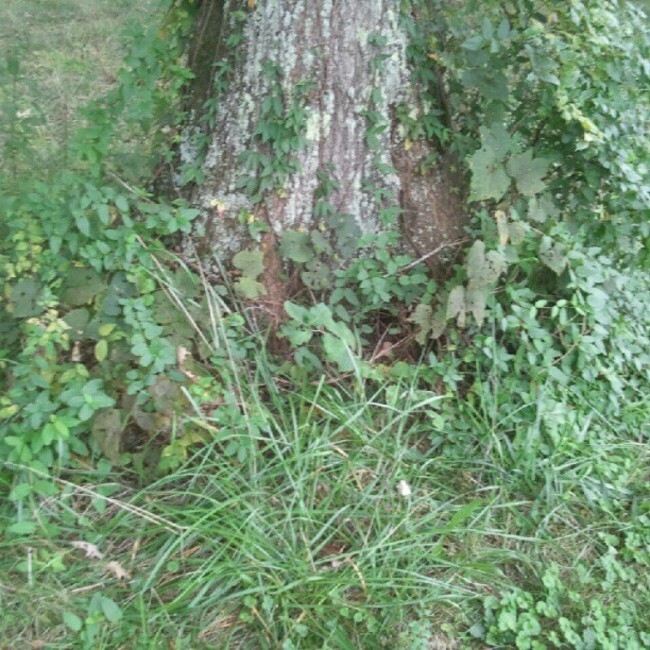 Her nest is neatly hidden beneath a bunch of poison ivy and isn't visible from the outside. Her previous nest was easy to spot. This one is much better. Perhaps she learned. It's only her second nest, after all. I think she picked the perfect spot. It's also sheltered nicely from the prevailing Southern winds. Right now it looks like she has about 24 eggs on there, one more than the last nest (we put a turkey egg underneath her last time). By my guess she should be due to hatch them on Monday or Tuesday, but I could be off a day or two either way. Sassy in monk mode, holding down the corner of the barnSassafras decided to get broody on her eggs in the "goat barn". This is the area where the goats can lounge while the other goats get milked. It's not really a 'barn' per se, it's an old tool shed that we converted to a barn. There's also a big paddock on the outside so they can be outside and graze while they wait. More frequently, however, they choose to stand near the fence and baaa at the nearby (but out of sight) buck pen. Now that the ladies are all coming into heat the evening milkings can be quite a hollering contest. Anyway, Sassy's nest is in the corner in the area where the goats lounge. When the goats come in for milking they go check out Sassy as if they hadn't seen her in that corner every single day for the past 3 weeks. They poke their noses down at her and she awakens from monk mode and pecks at their faces until the goats go on about their business (aka take a nap). 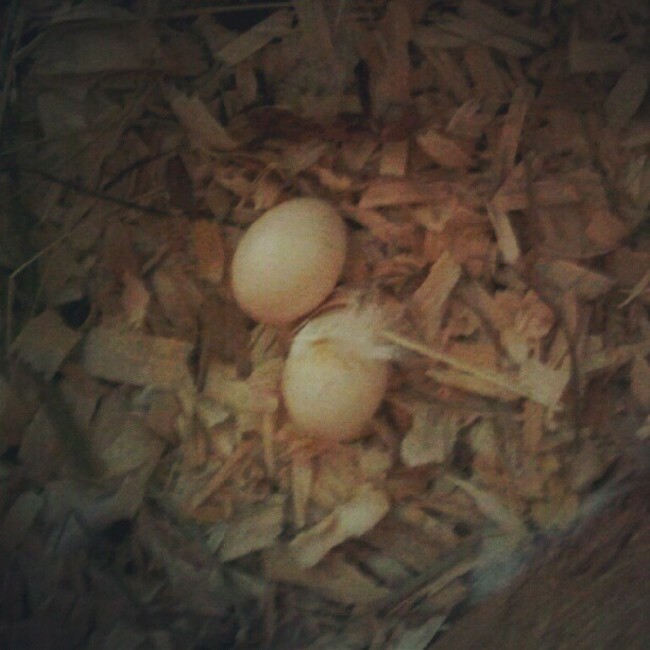 Sassy's nest, in comparison to Lady Guinea's, has only TWO eggs. We think they're fertile, but we can't be totally sure. She should be due at a similar time to Lady Guinea. Elvis, our silkie rooster (click to view his glorious crow), would be the proud father. He's my favorite (along with everyone else's, come on), so we're really excited for Sassy to hopefully hatch out a couple chicks. If you're wondering about Lady Guinea's previous gaggle of baby guineas, none of them made it. Two went missing after a few days. One made it a few weeks and was looking great, but then one day it was just gone. It had even gotten to the point where it was roosting in the coop. No idea what happened. This time around, we'll be taking the little baby guinea chicks and raising them up. If it were still summertime I would give her another chance (and she'll have another chance next year), but with the cold, rainy weather I'd rather see to it that the babies are OK.